Since we launched Fossil Free Funds a little over a year ago, over 25,000 visitors to the site have executed 100,000 searches; socially responsible fossil free funds have nearly tripled, to 28; and assets under management by those funds have more than tripled, to $10 billion. Now we’ve upped the ante with a truly exciting new feature — carbon footprinting. 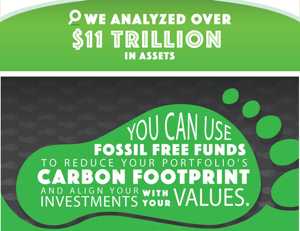 We analyzed over $11 trillion of assets in global mutual funds so that, for the first time ever, investors can assess the overall carbon footprint of their mutual funds and ETFs. We’ve taken data once seen only by Wall Street executives and made it freely available to all. We believe that if you truly understand the carbon risk and exposure embedded in your portfolio, you will be even more inspired to align your investing with your values for a clean energy future. Look for even more advances in Fossil Free Funds next year.